This is not the way I would ever repair a book. On the other hand, this is my book, and I bought it because of this repair; the massive amount of masking tape. I can appreciate that the owner—likely a machinist—did anything possible to keep this book functioning. This book was as important to a working machinist in pre-internet days as any of his other tools. 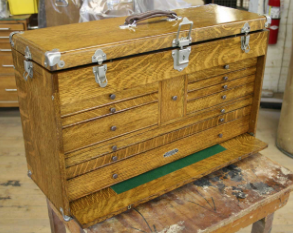 Machinery’s Handbook contains charts, reference information and formulas, and was so useful that Gerstner, a wood machinist chests manufacturer, incorporated a special drawer in some of their machinist’s chest to store this book. All books are tools for reading, but in many ways this book is even more of a tool than other books. So should it be repaired, conserved or restored differently? 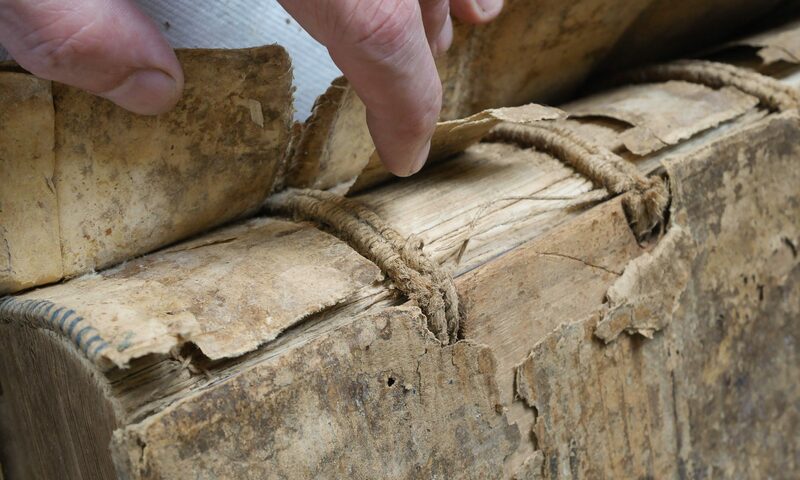 Nineteenth century owner repairs, which are often sewn, are becoming increasingly valued as part of the history of a book’s circulation, value, and usage. Could a masking tape repair be similarly prized a hundred years from now? But what would be left? Could the “patina” of cross-linked deteriorating adhesives someday be valued? 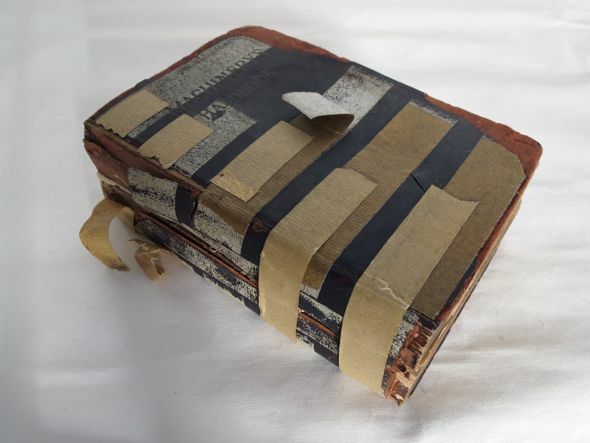 Mindy Dubansky recently posted other cool examples of owner repairs at ” It Seemed like a Good Idea at the Time: Crazy Book Repairs, Part One” In general, I don’t consider these types of repairs crazy, though. They are expedient. practical and reflective of the bookbinding knowledge of the owner, which is understandably low. Just don’t expect them to last too long. I repaired a Wizard of Oz book that had seen two repairs-by the owners grandmother with cellophane tape and mother with white adhesive tape. The owner asked me to retain his mother’s repair (she was a nurse). I carefully removed, cleaned and after the repair, replaced the six pieces of adhesive tape on the front and rear inner joints. It gave me the creeps to put that tape back but the owner was delighted. It was part of his books history.